Dedicated teachers and loving and supportive parents gave Delano Lewis reasons to believe in himself while he was growing up in the Kansas City, Kansas Public Schools. He said the greatest challenge he faced as a student was living in a segregated society. Since the historic school desegregation decision was not issued until 1954, Lewis spent most of his school days with an all-black student population and teaching staff. The advantages he said were the tremendous role models he had in faculty and staff. The disadvantages included the lack of experiences with other cultures, and a somewhat distorted view of reality. Today, Lewis is known worldwide in government and political circles. The statesman, politician and attorney has had an impressive career that includes working for the Department of Justice, the Equal Employment Opportunity Commission, the U.S. Peace Corps, serving as a legislative assistant to U.S. Senator Edward Brooke, and as chief of staff for delegate Walter Fauntroy of Washington, D.C. He worked 21 years in telecommunications with C&P Telephone Company and Bell Atlantic. He was named president and CEO of National Public Radio in 1994, and in 1999 he was nominated by President Clinton, and confirmed as U.S. Ambassador to South Africa. Lewis has traveled extensively, worked side by side with world leaders and has received numerous honors during his career. 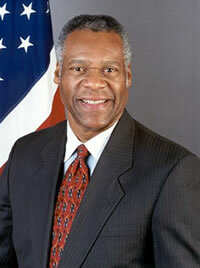 But one of his most memorable moments was serving as the keynote speaker at Kansas Boys State in 2004. Lewis attended Boys State during his junior and senior years at Sumner High School. He said the experiences he gained there were invaluable and unforgettable.